noun (plural com·forts) 1. state of being comfortable: conditions in which somebody feels physically relaxed Enjoy the comfort of your own home. 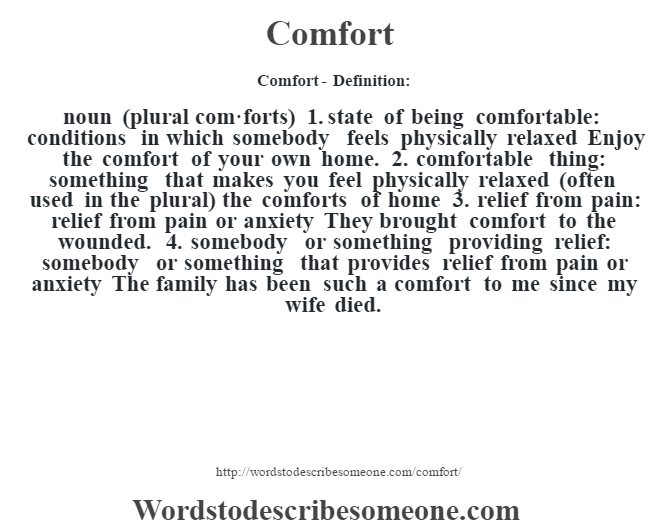 2. comfortable thing: something that makes you feel physically relaxed (often used in the plural) the comforts of home 3. relief from pain: relief from pain or anxiety They brought comfort to the wounded. 4. somebody or something providing relief: somebody or something that provides relief from pain or anxiety The family has been such a comfort to me since my wife died.